Build an Gett or Uber like app to jump into the ride-sharing business. 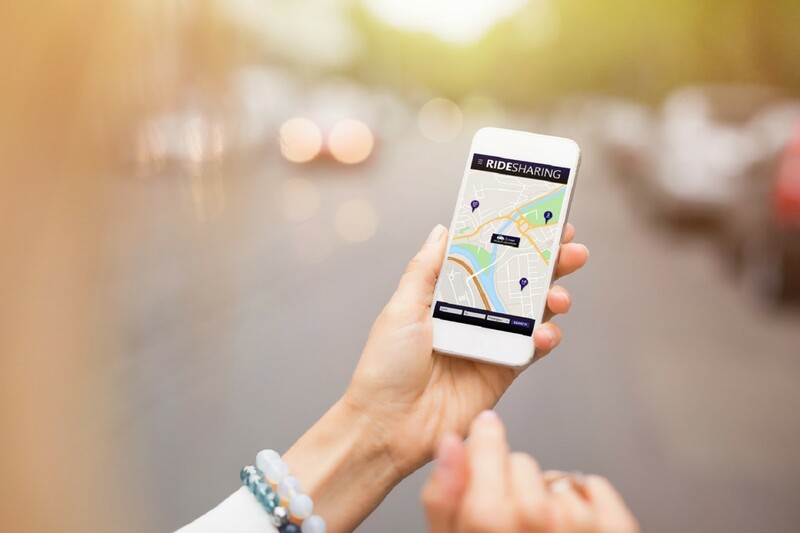 The growth of Uber and other Uber like taxi hailing services is evident from the fact that most of the people have started using ride-hailing services for their daily commute. People have become very comfortable with Uber like apps and taxi services all around the world as these ride-sharing companies are expanding day by day. The below chart shows that people choose Uber, Gett, and other such ride-hailing apps over the regular taxis. 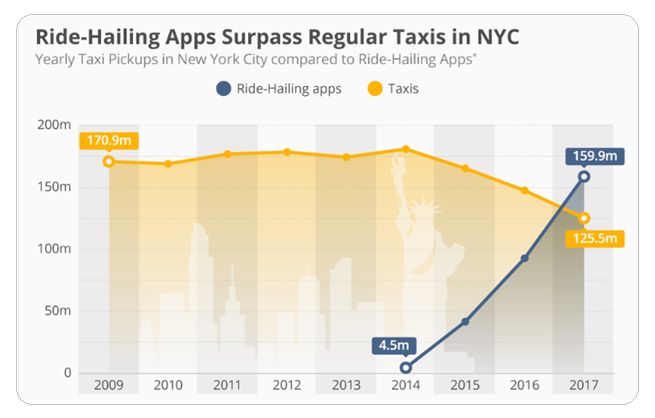 In New York, the ride-sharing cabs can be seen more whereas the city’s green and yellow cabs on the streets are steadily declining. For people in taxi businesses, having an app and entering the ride-hailing platform is a must. Want to know how a taxi app startup grows? Read on about Gett. One such company which has made it big and has given tough competition to Uber itself is Gett which was formerly known as GetTaxi. It is an Israeli on-demand mobility company. It connects customers with transportation, goods, and services. The taxies can be booked through a company website or the GPS-based smartphone app. The Gett app was founded by entrepreneurs from Israel Shahar Waiser and Roi More. Waiser got the idea of the development of a taxi app when he was waiting for 30 minutes at an airport in Palo Alto, California. He launched the beta version in Hebrew which started operating in Tel Aviv. After two years of successful driving, the service was launched in London in 2011. In 2012, Gett expanded to Moscow and opened its first USA office in New York with an aim to revolutionize the NYC taxi experience. By June 2012, the company had raised more than $30 million. The Gett taxi has a unique revenue model which varies from country to country. It includes one of the three models – to charge a monthly dispatch fees from drivers, charging a fee from drivers per ride or charge fees for corporate rides. Gett even planed splitting taxis with other users in the nearby area which is nothing but a share taxi feature in Uber. Gett app is compatible with iPhone and Android platforms and is very popular in Israel, the United Kingdom, and Russia. Here is a chart showing top apps in Great Britain. 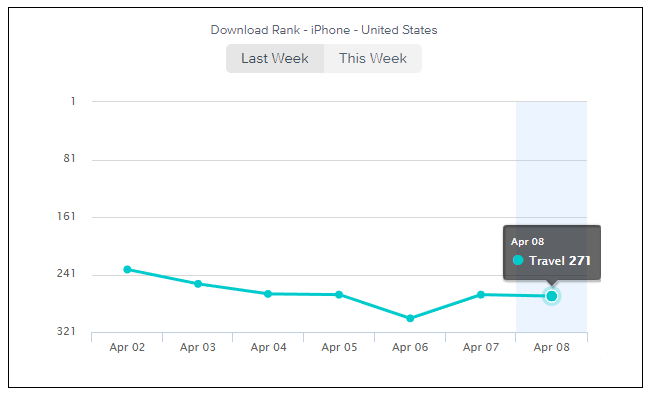 The Gett app has over 10 million downloads and is ranked 462 as of April 2019 according to a graph in Similarweb. 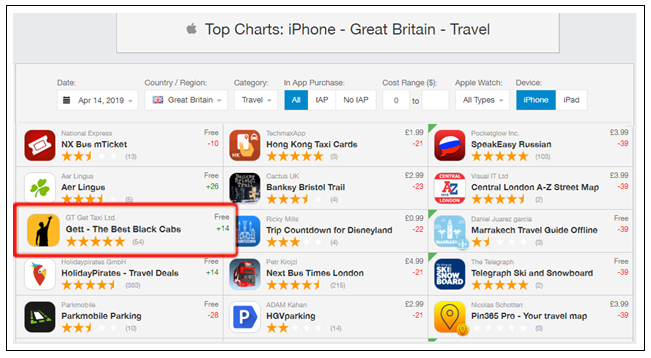 Another Graph from App Annie shows that Gett app is ranked 271 in the Travel category in the last week. There was a simple idea behind Gett app, they wanted to treat their drivers better in order to provide better services to the passengers. The Gett company has set its quality standards and has very best drivers. It is said to be Europe’s largest on-demand car service by looking at its revenues. Gett is a global leader in the corporate on-demand transportation market and it’s business solutions enable the companies and riders to book rides and track their expenses worldwide through just a single platform. More than 20000 companies are already using Gett in over 1000 cities and 56 countries. Gett’ sales are over $1 billion mobility per year and half of those sales are generated in NewYork and London. The lucrative B2B services that it produces has already made Gett the contribution margin profitable across each of its markets. It is on its way to becoming operationally profitable across the globe in Q1, 2019. $300 million of its funding Gett has received from the world’s number 1 car maker Volkswagen Group. In 2018, Gett got a “Unicorn” status and was valued at $1.4 billion. According to Crunchbase, till now, Gett had a total of 9 funding rounds and they had raised more than $693millions. The latest funding round was on 7th June 2018 which was a corporate round. The number of investors which are funding Gett is 10 out of which there are 7 lead investors. The most recent investors are Volkswagen Group and Da Vinci Capital. 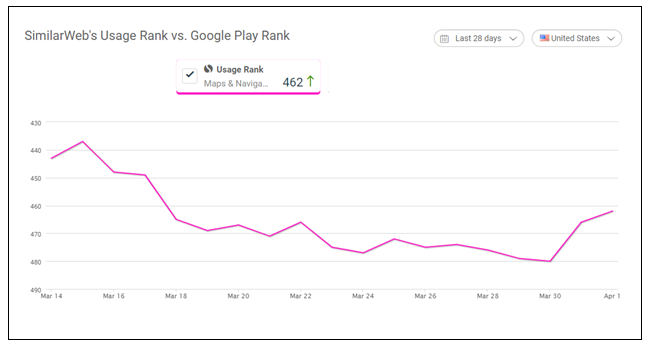 Gett has more than 163850 downloads in the last 30 days. The annual revenue of Gett is $50.5 million and it competes with Lyft, Uber, and MyTaxi. Gett has acquired 3 organizations and the most recent being StreetSmart in August 2017. Gett had previously acquired one of its competitors in the ride-hailing business- Juno in 2017. What should you consider for your uber like apps or taxi app development? The table below shows the minimum hours required to build a taxi app for your business. Since there is a lot more expected in the mobilization industry in the coming years, you have a lot of chances to dive in and explore this sector as your business opportunity. You need to check out the area before launching your taxi app anywhere. You must know the competitors and their business models in order to present the passengers with something new and exciting in order to grab their attention. You need something unique to present your target audience and grow your business. With so many ride-hailing services around to confuse the daily commuters, you need to get them some really pocket-friendly rates and better services than others. Like Gett, you can also make sure that you care for your drivers who in turn will be caring for your passengers. Try to start from the locations where there is less competition and you can have an upper hand. Be confident, a startup can soon become an IPO. We can help you build an amazing taxi app for your business that can attract the attention of more and more people with interesting features and user-friendly interface. The cost of building a taxi app like Uber or Gett depends upon the features that one includes and the hours invested while building those features. Connect with us to discuss further regarding the taxi app development. We have entertained over 5000 taxi app development queries and have delivered more than 200+ successful apps.